LAST LOSSES OF THE SECOND WORLD WAR, 1939-1945 – Christian Salvesen & Co.
22 March 2015 is the 70th anniversary of the sinking of the steam cargo vessel Empire Kingsley. Its sinking during the closing phase of the Second World War was the last maritime loss suffered by the general shipping and whaling firm Christian Salvesen & Co. of Leith during the War. Families couldn’t have known it at the time, but the ship’s destruction with the loss of 8 lives happened only 7-weeks before VE-Day (Victory in Europe). The Empire Kingsley was one of a number of Empire vessels listed as Salvesen ships – other losses of these included the Empire Bruce, Empire Dunstan, and Empire Heritage (the latter being the firm’s greatest as far as lives were concerned with 60 crew dead) – and each was in fact owned by the Ministry of War Transport and managed on contract by Christian Salvesen & Co.
On Thursday 22 March 1945, on its way from Ghent to Manchester, the Empire Kingsley was sunk by a torpedo from the German submarine U-315 off Land’s End in Cornwall. U-315 surrendered at Trondheim in Norway a few weeks later in May 1945. It had hunted in several patrols since entering service with the German Kriegsmarine in July 1943, but had sunk only the Empire Kingsley and written off a Canadian frigate. The British merchant marine suffered heavy losses during 1939-1945. Merchant ships and their crews suffered attack from submarines, surface raiders, mines and assault from the air. Christian Salvesen & Co. suffered no less than any other firm, indeed the whaling side of its business was all but suspended after the 1940-41 season. The firm’s transport ships and whale catchers were pressed into naval service under the control of the Ministry for War Transport, with its factory ships being used as tankers and heavy lift vessels. The firm suffered its first wartime loss at sea with the sinking of the Glen Farg – a coaster – by the German submarine U-23 on 4 October 1939. The ship was on its way home from Norway to Methil and Grangemouth with a cargo of pulp, carbide and ferro chrome when it was captured and sunk off the north of Scotland, west of Orkney and Duncansby Head. One seaman was lost, but there were 16 survivors who were picked up by a Royal Navy destroyer based at Scapa Flow, Orkney. The loss of the whale factory ship Salvestria in July 1940 – on Edinburgh’s own doorstep – brought the deaths of 10 seamen. On 22 July 1940, two miles east of Inchkeith in the Firth of Forth, the ship was sunk by a magnetic mine while on its way to the naval installation at Rosyth with a cargo of fuel oil. The same year, in September 1940, the whale factory ship New Sevilla was sunk off Northern Ireland – a bit out from Islay – on the way from Liverpool to Aruba and South Georgia. The vessel was carrying a cargo of whaling stores when it was struck by a torpedo fired from the German submarine U-138. The attack could have had worse consequences as the human cost was 2 lives lost out of a total complement of 285. Further west of Ireland, and south of Iceland, the Sirikishna was lost in February 1941. This steam cargo ship was on its way from Glasgow to Halifax, Nova Scotia, and had become separated from a convoy. It was attacked by the submarine U-96. Pages from the Minutes of Meeting of Directors of The South Georgia Co. Ltd. […] 17 December 1941, reporting the loss of several vessels… ‘Sirikishna’, ‘Sevra’, ‘Sarna’, and ‘Stora’. Not all attacks on Salvesen’s stock ended in a sinking. The vessels Coronda, P.L.M. XIV (a former French vessel taken as booty when France surrendered), Folda, and Daphne II were each either bombed or torpedoed but none of them were immediately lost. In September 1940, the steam-driven tanker and supply ship Coronda (the second Salvesen vessel to bear that name… the namesake was the vessel that transported the first penguins to Edinburgh Zoo in 1913) was bombed in a German air attack off Northern Ireland on a journey from Iceland to Liverpool, carrying herring-oil. Coronda suffered the loss of 21 seamen and suffered heavy fire-damage, and was beached on Kaimes Bay, Tighnabruaich, in the Kyles of Bute. P.L.M. XIV was torpedoed on Smith’s Knoll (part of the Haisborough Sands, off Norfolk) in October 1940 with the loss of 10 crew, and the vessel was towed to Immingham. In November 1940, Folda was bombed off the Thames estuary with the deaths of 3 seamen, and then the ship was towed to Harwich. Then, in March 1941, the vessel Daphne II was torpedoed off the Humber with no human loss, and towed to Grimsby. Not all the attacks on Salvesen’s ships ended in the deaths of crew. Between September and October 1940 the Crown Arun, Shekatika, Strombus and Snefjeld were each mined or torpedoed. The Crown Arun, known earlier as Hannah Böge, and taken into British service as war booty, then placed under Salvesen management by the Ministry of Shipping, sank off north west Ireland with a cargo of pit-props while in a convoy. Shekatika was sunk near Rockall en route to Hartlepool carrying steel and pit-props. Strombus broke up near Swansea after being attacked just as it was setting off for South Georgia, and Snefjeld sank north west of Ireland, also while in a convoy. None suffered human loss, and as has already been told Daphne II was attacked in 1941 with no losses either. Then, in March 1942, the tanker Peder Bogen was torpedoed, shelled and sunk south east of Bermuda by the Italian submarine Morosini, and again all crew were saved. The crews of the Indra lost in the Atlantic just above the equator in November 1942 and the Empire Bruce lost off the coast of Sierra Leone in April 1943 were also saved. However, a few months after the loss of the Peder Bogen in March 1942 – and the saving of all the crew – the Saganaga was lost at anchor in Wabana Harbour, Newfoundland, in September 1942 with the loss of up to 30 lives. The steam cargo vessel loaded with iron-ore was sunk by a torpedo from the German submarine U-513. The Salvesen vessel Saganaga was reported in the Minutes of the Meeting of Directors of the Salvesen enterprise, The South Georgia Co. Ltd., on 30 December 1942, as having an insurance value of £155,000, which at today’s values would be circa £6.5-million. The Sourabaya which was lost earlier – in October 1942 – had an insurance value of £220,000, or £9.2-million today. Sourabaya was a whale factory ship and it was steaming in convoy from New York to Liverpool with a cargo of fuel oil, war stores and landing craft. It was torpedoed and sunk by the German submarine U-436 in the mid-Atlantic. 30 crew lost their lives. Another whale factory ship was lost in October 1942 – the Southern Empress. This ship was on its way to Glasgow, in convoy, and was also carrying a cargo of fuel oil and landing craft. In a position north west of St. John’s, Newfoundland, and south of Kap Farvel, Greenland, the Southern Empress was torpedoed and sunk by the German submarine U-221. The greatest loss of life came in September 1944 when the tanker Empire Heritage, managed by Salvesen, was sunk by a torpedo north west of Malin Head, Ireland, on its way to Liverpool from New York. The vessel was carrying a cargo of fuel oil and a deck cargo including Sherman tanks when it was met by German submarine U-482. Over 100 lives were lost (of which 60 were crew). On 3 March 1945, the Salvesen vessel Southern Flower, formerly a whale catcher and which had been requisitioned for Admiralty service in anti-submarine duties, was torpedoed and sunk off the Icelandic coast by U-1022 patrolling between Bergen in Norway and southern Iceland. The Southern Flower had been owned by Salvesen since 1941 the year in which the firm acquired the Southern Whaling and Sealing Co. Ltd. from Unilever (Lever Bros.) along with its two whale factory-ships and fifteen whale-catchers. Then, later the same month the Empire Kingsley was sunk off Land’s End with the loss of 8 lives from a crew of 57. Many of Salvesen’s officers and men received awards for gallantry and for meritorious service at sea during the War, and others were commended. Appreciation of the efforts and sacrifice of the seamen during the War years was met by Christian Salvesen & Co. through the establishment of a fund to assist the families of those whose lives were lost. Money was also made available from various members of the Salvesen family for the building of homes for veterans through the Scottish Veterans’ Garden City Association. Construction of the houses designed in a ‘garden village’ style in Muirhouse, Edinburgh, was begun in 1946, and the houses were occupied by 1948. Streets were named Salvesen Crescent, Salvesen Gardens, Salvesen Grove, and Salvesen Terrace. This entry was posted in Collections and tagged Christian Salvesen & Co. Ltd., Salvesen & Co., Salvesen Archive, Scottish Veterans' Garden City Association, Second World War, shipping, South Georgia Co. Ltd., submarine warfare, whaling on 20/03/2015 by eddiegd. A university figure that deserves far greater recognition is our first woman professor Elizabeth Wiskemann (1899-1971), who held the Montague Burton Chair of International Relations from 1958 to 1961. Although her name is absent from subsequent published histories, the University Journal for May 1958 certainly grasped the significance of her arrival. Announcing ‘the first woman to be appointed to an Edinburgh Chair’, it presented her as ‘a writer of authority on international affairs’, who had held appointments as a ‘press attaché to the British Legation at Berne, as a correspondent of The Economist at Rome, and as Director of the Carnegie Peace Endowment for Trieste’. While these are major achievements, her personal contribution to 20th-century history ran much deeper. From 1930, Wiskemann (whose grandfather was German) worked as a political journalist in Berlin for the New Statesman and other publications, and was among the first to warn of the dangers of Nazism. So effective were her articles in alerting international readers to the true nature of Hitler’s regime that she was expelled from Germany by the Gestapo in 1937. She continued to expose Nazi plans for German expansion in her influential books Czechs and Germans (1938) and Undeclared War (1939). Wiskemann did indeed spend the war as a press attaché in Switzerland, but this was cover for her true job of secretly gathering non-military intelligence from Germany and occupied Europe via the contacts she had made as a journalist. In May 1944, British Intelligence learned that the hitherto unknown destination to which Hungarian Jews were being deported was Auschwitz. When the allies turned down a request to bomb the railway lines (due to limited resources), Wiskemann hit on a cunning ploy. Knowing that it would be seen by Hungarian intelligence, she deliberately sent an unencrypted telegram to the Foreign Office in London. This contained the addresses of the offices and homes of the Hungarian government officials best positioned to halt the deportations and suggested that they be targeted in a bombing raid. When, quite coincidentally, several of these buildings were hit in a US raid on 2 July, the Hungarian government leapt to the conclusion that Wiskemann’s telegram had been acted upon and put an end to the deportations. Wiskemann continued to publish on German and Italian politics after the War. 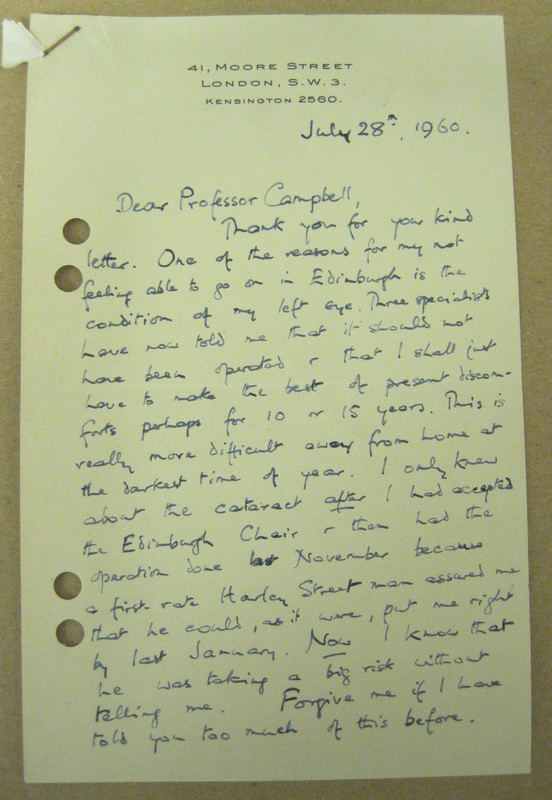 She was appointed to the Edinburgh Chair on the recommendation of William Norton Medlicott (1900-1987), Professor of International History at the London School of Economics, who described her as ‘a pleasant, active, middle-aged woman’ who would ‘be a very suitable choice’. Lectures by previous holders of the Chair had been poorly attended as they formed part of no degree course. Wiskemann, however, did much to boost the profile of her post by inviting national and international experts to lead discussion groups on issues of the day. 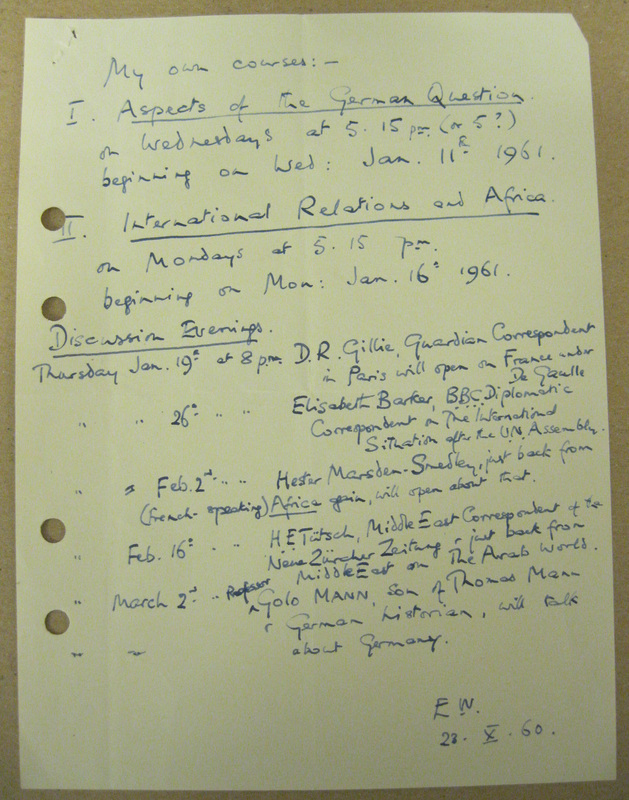 The focus of her own teaching increasingly moved away from European issues to developments in post-colonial Africa. 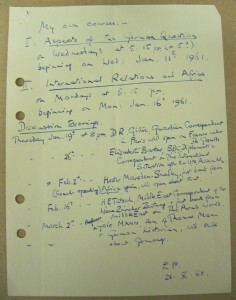 Click on the image, right, to see a handwritten list of lectures and discussion groups for 1961. The Montague Burton Chair (endowed by Sir Maurice Montague Burton, founder of the men’s clothing chain) was a three-year appointment, at the end of which holders were eligible to apply for re-election. Wiskemann chose not to stand for re-election, much to the University Court’s dismay, as the Chair had proved difficult to fill. 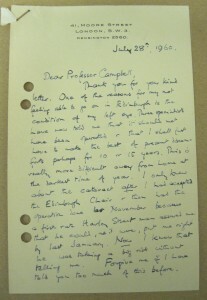 In a letter of 28 July 1960 (click right) Wickemann explained that deteriorating eyesight, exacerbated by a recent unsuccessful operation, had led to her decision. Tragically, this condition would eventually lead Wiskemann to take her own life in 1971. 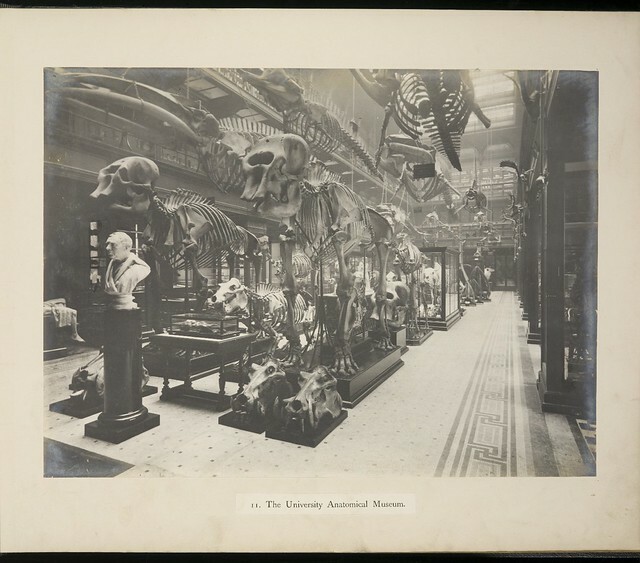 This entry was posted in staff, women on 10/03/2015 by pbarnaby.